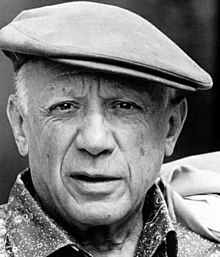 Pablo Diego José Francisco de Paula Juan Nepomuceno María de los Remedios Cipriano de la Santísima Trinidad Ruiz y Picasso kent as Pablo Ruiz Picasso (Spaingie pronunciation: ['paβlo rwiθ pi'kaso]; 25 October 1881 – 8 Aprile 1973) wis a Spainyie painter, draughtsman, an sculptor who lived maist o his adult life in Fraunce. He is best kent for co-foondin the Cubist movement an for the wide variety o styles embodied in his wirk. Amang his maist famous wirks are the proto-Cubist Les Demoiselles d'Avignon (1907) an Guernica (1937), his portrayal o the German bombing o Guernica durin the Spainyie Ceevil War. Picasso demonstratit uncanny airtistic talent in his early years, paintin in a realistic manner throu his childhuid an adolescence; durin the first decade o the 20t century his style chynged as he experimentit wi different theories, techniques, an ideas. His revolutionary airtistic accomplishments brought him universal renown an immense fortune throughoot his life, makin him ane o the best-kent figures in 20t century airt. Wikimedia Commons haes media relatit tae Pablo Picasso. This page wis last eeditit on 23 Mey 2018, at 18:49.